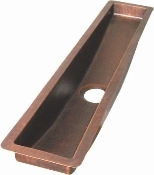 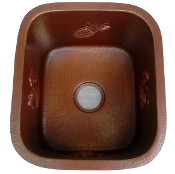 Custom Copper Bar Sinks: Build To Any Size. 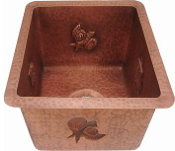 200 Decorative Designs. 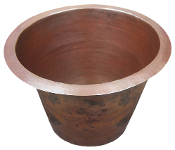 Everthing We Build Is Built To The Customer's Specifications. 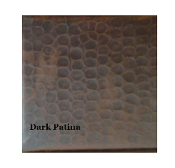 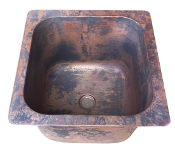 You Choose The Size, 200 Decorative Design And Mix & Match 16 Patina Finishes. 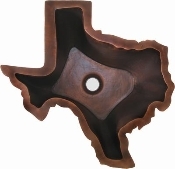 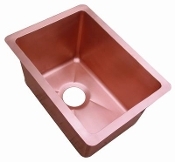 Cast Bronze Bar Sink 14" * Build In Copper Copper Bar Sink Round 16" Designs Special Offer Copper Bar Sink Triangle 24" x 19" 40% Off Copper Trough River Sink 51" x 14" x 8"
Copper Trough River Sink 24" x 12" x 4" Copper Trough River Sink 33" x 9" x 7" Copper Trough River Sink 43" x 9" x 6" Copper Trough River Sink 51" x 14" x 8"
Copper Bar Sink 20" x 12" Designs Copper Sink Drains Copper Bar Sink 12" x 12" Copper Bar Sink 14" x 14"
Copper Bar Sink 15" x 15" Copper Bar Sink 15" x 15" Copper Bar Sink 16" x 12" Copper Bar Sink 16" x 16"
Copper Bar Sink 20" x 18" x 10" 40% Off Copper Bar Sink Round 22" Copper Bar Sink Round 24" Copper Bar Sink Rounded Front 18" x 14"
Copper Bar Sink Rounded Front 20" x 16" Copper Bar Sink Rounded Front 22" x 18" Copper Bar Sink Round 14" 40% Off Copper Bar Sink 14" x 14"
Copper Bar Sink 16" x 16" Designs Copper Bar Sink 18" x 14" Copper Bar Sink 20" x 18" Copper Bar Sink 18" x 18"
Copper Bar Sink 20" x 12" Copper Bar Sink 20" x 16" Copper Bar Sink 20" x 20" Copper Bar Sink Round 14"
Copper Bar Sink Round 16" Copper Bar Sink Round 18" Copper Bar Sink Round 20" Copper Bar Sink Rounded Front 16" x 12"
Add A Decorative Design To The Interior Of Your Copper Bar Sink! 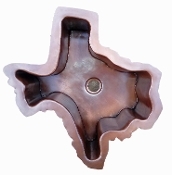 Call Customer Service 800-989-5166. 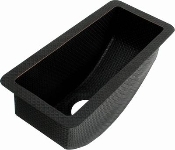 Before Buying, Be Sure To Check Our Coupon Page For Our Latest Sale Discounts!